Under head coach Sean Price, the Labette County Grizzlies have been on a roll. The program that won only nine games in the 2011, 2012, 2013, and 2014 seasons combined is on an eight-game winning streak. However, the Southeast Kansas League champions will face their biggest test of the season with they travel to play the defending state champion and top-ranked Bishop Miege Stags. Bishop Miege has won its last 22 games. Last week, the Grizzlies defeated Paola 34-7 after scoring 21 points in the second half. Labette County boasts a balanced offense with 191.8 yards per game through the air and 200.3 on the ground. Junior quarterback Easton Dean has passed for 1,778 yards and 22 touchdowns with only three interceptions. 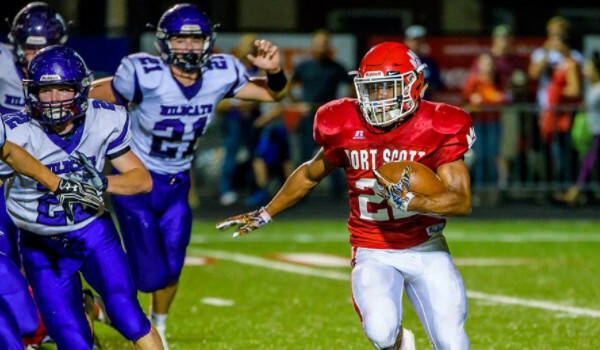 Senior running back T.J. Mayhue has rushed for 1,009 yards and 21 touchdowns on 165 attempts. Tanner Russell, Kale Irwin, Owyn Back, and Josiah Rexwinkle are the top receiving targets with 560, 449, 343, and 258 yards, respectively. The Stags are fresh off a 58-6 win over Basehor-Linwood. Bishop Miege has outscored 4A D-I schools by a combined score of 214-26. Miege also boasts a balanced offense, rushing for 264.9 yards per game and passing for 223.7 yards per game. Senior quarterback Carter Putz has passed for 2,118 yards and 26 touchdowns. His main target has been sophomore Daniel Jackson with 39 catches for 933 yards and 10 touchdowns. Sophomore Brison Cobbins leads the team in rushing with 943 yards and 11 touchdowns on only 89 carries. While Labette County is enjoying its best season in recent history, it would take quite the outing to knock off the Stags. This marks the fourth time in the last two years these teams have matched up. Maize South is 3-0 in those games with a 14-6 win in the regular season and a 35-27 victory in the playoffs last fall. This year, the Mavericks won 9-0 in Week 2. McPherson has a total margin of 367-77 and leads 4A-II in scoring defense. Maize South has a total margin of 370-101 and is sixth in scoring defense. The Mavericks are seventh in offense, while the Bullpups rank eighth. In the first round of the playoffs, McPherson defeated Buhler, 15-14, in overtime on the game's final play, a two-point conversion for one of the season’s hallmark moments. It marked McPherson's second victory against Buhler this year. Maize South rolled over Wellington, 49-7. A win would mean school history for both programs. McPherson has never made a state football finale with its two semifinal appearances coming in '87 and '08. Maize South has been a consistent power under ninth-year coach Brent Pfeifer (64-26), the lone coach in program history. Last season's semifinal berth marked the best showing in school annals. McPherson, which finished second to Bishop Miege in 4A-I scoring defense last year, has enjoyed another standout quarterbacking year. The Bullpups graduated Casen Hoover but junior Kyler Hoppes has stepped in at an all-state caliber level. He has completed 124 of 196 passes for 1,615 yards with a 21/5 TD/INT ratio. Junior Jace Kinnamon has 158 carries for 933 yards and 14 scores. McPherson has forced 18 turnovers and is plus-five in turnover margin. Seniors Wyatt Seidl, Jayse Alexander and Mike Mendez have combined for 39 TFLs. In the 9-0 first meeting, Maize South's defense limited McPherson to 52 plays for 170 yards. The Bullpups did not have a turnover, but did have a safety that turned the game. Maize South opened the season with three straight shutouts. The Maverick’s defensive dominance extended to district play when they defeated Andover Central - also a 4A-I quarterfinalist - 23-13 behind six forced turnovers. Max Domnick had 45 carries for 197 rushing yards and three TDs. In the first round of the playoffs, Wellington scored first on the game-opening kickoff return and long pass on the first play. Maize South then tallied 49 straight points. In the third quarter, Maize South's defense limited Wellington without a first down. The Mavericks had 461 yards in total offense, including 13 of 15 passing for 247 yards from Ryan Grabman. Bradyn Wiens had eight catches for 218 yards and a TD. These are two outstanding teams, especially defensively. Somewhat surprisingly, Maize South's last five years have all ended with home playoff losses with the average margin of defeat 13.4 points. This year's team ends the drought in another close game.